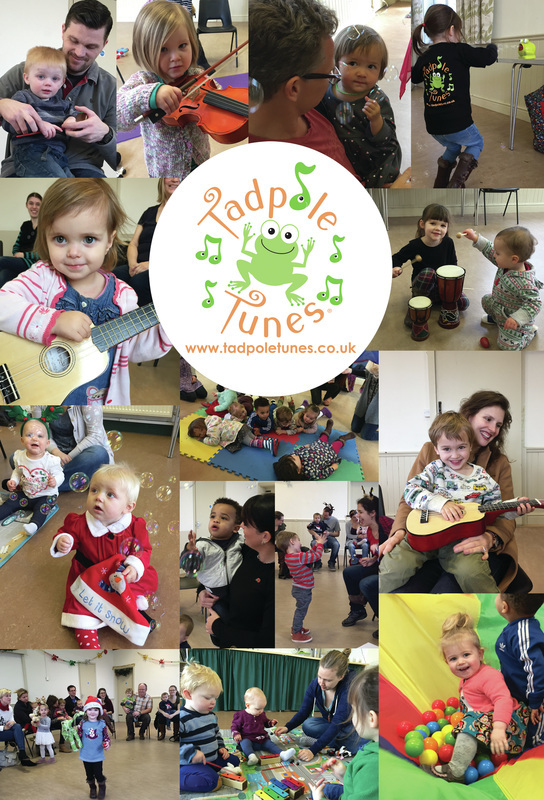 We went to Tadpole Tunes for two years ourselves as customers, and I was so inspired watching Kirsty in our sessions, that I started up my own sessions from September 2014. I ran sessions for two years, but have recently handed over to Emma, who will be looking after my lovely group at Risby on Thursday mornings. Amelia and I wish her lots of luck and send lots of love to all our Tadpole friends. Each term has a different theme, which means they learn topical songs, play with particular toys, and hear relevant stories all relating to that topic. Some of the topics covered include transport, etiquette, and nature. 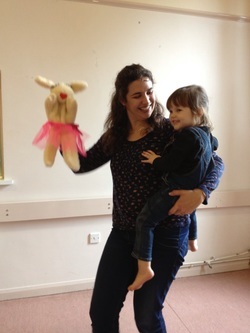 This makes the classes really focussed, especially for the older children. In each session, they start with the same opening songs and dancing, and always end with bubbles and a sticker, so the babies get used to a routine. They are encouraged to be up on their feet and dancing. In between, it varies each week. They have some songs with actions, some with toys and puppets, some with instruments, some with dressing up. It's always really energetic and it teaches the children to share and to relate various songs to things they may find at home. Some weeks they may listen to a story, which makes a nice calm pause (sometimes!). Every week they get to handle a different type of real instrument, often percussion. They learn to keep a rhythm going and to listen so they know when to start and stop. I was very nervous about joining any musical group, having had a very musical background myself. I didn't want to go somewhere with tacky midi-style nursery rhymes or where the children would be patronised. 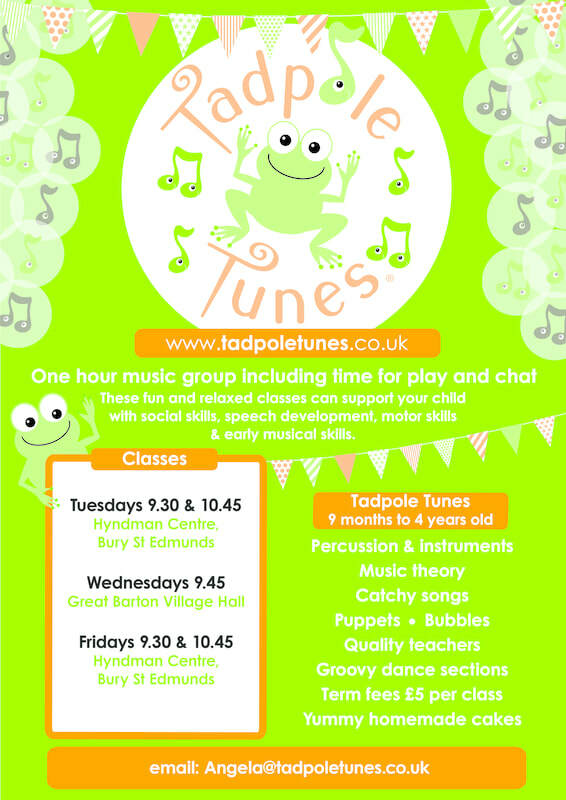 I was utterly thrilled to find Tadpole Tunes as it is run by real musicians, who write and record all of their own music, and most of it is original. The sessions are extremely hands-on and all-inclusive, and totally relaxed. There are a few familiar favourites, which have been tastefully arranged with fairly catchy and often jazzy tracks for dancing to! They use real instruments in their backing tracks. 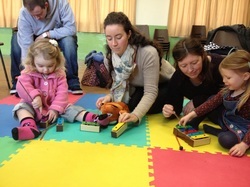 The teacher sings every song, and runs through new ones so the mummies and daddies have a chance to learn the words. There are CDs you can buy to practice at home too. After each session, there is half an hour of play time, where the kids can play with toys and the grown ups can have a cup of tea and some delicious home-made cake. 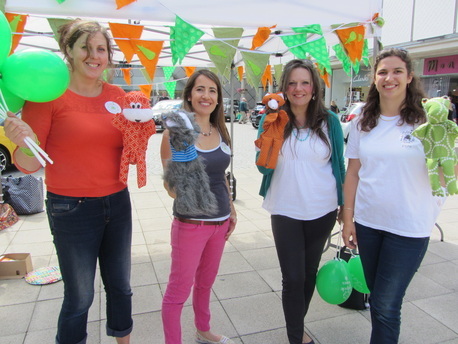 It is a lovely, relaxed atmosphere and a wonderful opportunity for the babies to try out new toys, and watch how older (or younger) children play. It is exceptionally good value for money, and I would recommend it to anyone. I have made some wonderful new friends, and managed to persuade some older ones to come along with us!